Best Outdoor Swing Sets for Sale! Are you looking for the most fun best rated backyard swing sets for kids to set up just in time for summer? What better way to keep the little ones having fun outdoors than with a cool swing set? It was my favorite past time as a child! But which swing set is the best for your backyard? Outdoor swing sets usually come in wood or metal, the indoor ones are usually made of plastic. The one you see on this picture is perfect for kids of all ages, little ones and ‘big ones’! How old are the children using the swing set and how many kids will be using it on a day to day basis? How big is my backyard? Do I prefer wood or metal? I will help you as much as I can here, selecting the backyard swing sets based on their material, size, price, kids ages and parents reviews. Best Wooden Swing Sets for Kids! Since I love the wood ones so much, I decided to start with them. The one you see on this picture, besides looking absolutely gorgeous, is perfect for children between the ages of 2 and 10 years old and it fits approximately 6 to 8 kids playing at the same time. I always recommend parents to get a complete swing set, that also comes with at least one slide! This wood swing set comes with a beautiful slide and also a fun ‘play area’ in the back! It will take you a couple of days to set it up though, but it’s not difficult. This swing set will fit small to medium sized backyards. 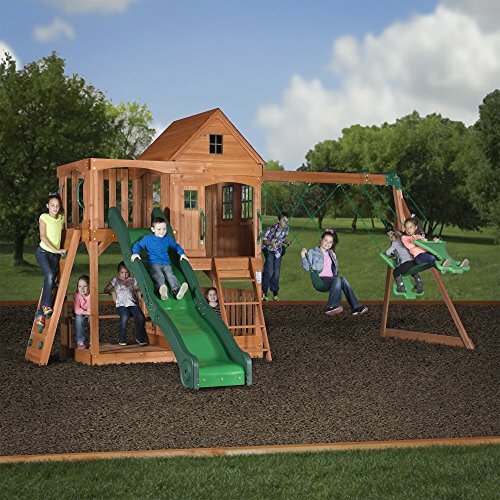 Very Affordable Cedar Wood Playset for the Backyard! Great Swing Set for Smaller Backyards! This gorgeous and ultra-FUN (not to mention very affordable!) cedar wood, metal and plastic outdoor swing set for sale is perfect for a smaller backyard as it only requires a little over 10 x 10 feet of space. 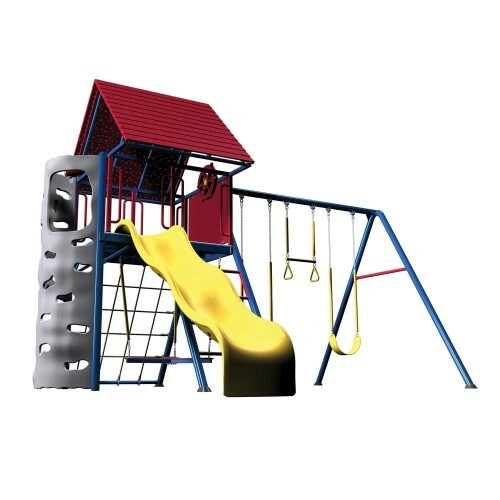 It not only has the fun swings and the fun 8-foot slide, but also a cool upper play deck and a rock wall ladder! (The younger kids love to go up the play deck because it makes them feel very tall! It fits children ages 3 to around 10 years old and many kids can also play together! It is absolutely perfect for couples with 3 children! The cedar wood is one of the best for outdoor use, since it is weather-resistant and insect-resistant as well. 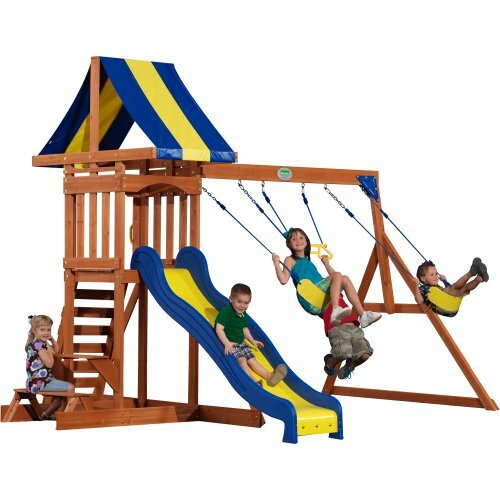 This wood swing set will also fit a small to medium sized backyard. Gorgeous All Cedar Wood Outdoor Swing Set with Large Sundeck and Upper Deck! The Most FUN Solid Wood Swing Sets for Sale! This awesome cedar wood swing set is one of the most beautiful large outdoor wooden swing sets for kids in my opinion! It has a gorgeous finish and it fits as many as 10 kids playing at the same time! Perfect for birthday parties or large family gatherings, as each child will always have something to do! As you can see the kids are having fun climbing the awesome rock wall, going down the cool 10’wavy slide, swinging and playing inside the fun ‘lookout’ house upstairs that is huge! There’s also a fun and also very big shaded lower deck for the kids to ‘hang out’! Is this awesome for birthday parties, weekend barbecues and family gatherings or what? All the wood comes pre-cut, pre-stained and pre-drilled, just ready to put together. It also comes with all the hardware necessary to assemble. This will fit up to 10 kids at the same time ages 3 to about 10 years old. I cannot think of a better outdoor gift idea for children than this! 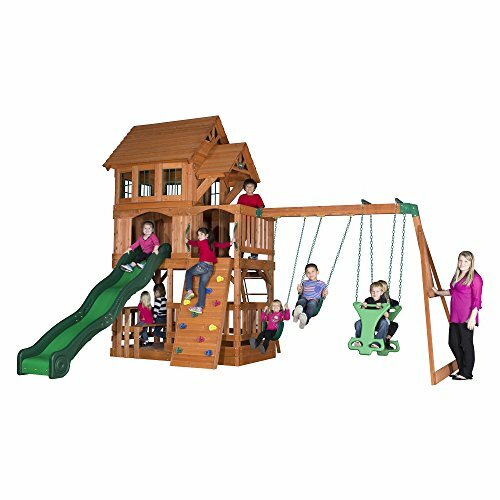 Best Gorilla Cedar Wood Playsets! This gorgeous outdoor wooden swing set for sale is perfect for smaller children, ages 1 to about 7 and 8 years old. They love to test their ‘skills’ in rock climbing, tire swinging and rope ladder climbing! They also love to go down the wave slide! If you have several young children in the house and want them to spend some quality time playing outdoors in the morning sun, then this is a really good investment! It beats video-games for sure! We need to encourage our children to spend more time outside and if you have a nice backyard with a fence, then you relax for a few hours in the afternoon reading a nice book while your kids play on their new swing set. Parents said this wood swing set is perfect for birthday parties! *This guy offers excellent tips on how to install and outdoor swing set paying attention to safety! Best Metal Swing Sets for Kids! If you prefer metal swing sets instead of wood, this is a beautiful and very colorful outdoor metal swing set for kids of all ages! As you can see it’s full of activities! They can slide down the fun yellow slide, climb the wall, use the trapeze bar with fun gym rings, swing on the heavy-duty swings or just enjoy the view from the deck! This metal swing set is also very durable and some parents have had it for many, many years! The reason why some parents prefer a metal swing set over a wooden one is that they don’t have to worry about splintering or fading wood. The fun slide is about 8 feet long! The climbing wall on the side is made of plastic, but it’s very strong. 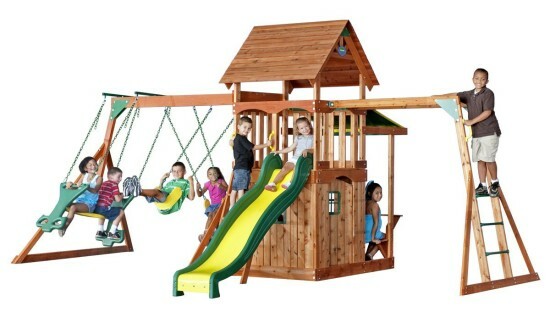 Overall parents said this is a great complete backyard swing set for the money! FUN Backyard Swing Set with 9 Foot Wavy Slide! Who is having a blast with their new outdoor swing set with a huge slide? This one reminds me so much of my childhood! I used to love playing on swing sets with my sisters and friends! I felt to free and so happy! 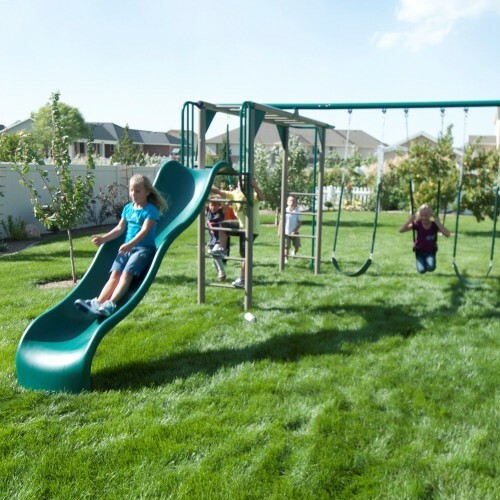 This is one of the best rated backyard swing sets for older kids! It is extremely sturdy and very durable! Parents said it’s well worth the money! It’s something to last for many years and maybe even pass to the grandchildren! Needless to say the kids absolutely LOVE the huge slide and it’s just like having their very own playground in their own backyard! The monkey bars are also a blast and it also brings back some great childhood memories! The price is fair and parents also said it’s fairly easy to put together. Affordable Outdoor Swing Sets for Sale! If you are on a budget and looking for the best but affordable outdoor swing sets under 300 dollars, this one in the picture is a very good option! It’s very big, as you can see, and it fits most children ages 2 to about 10 years old! I think it looks amazing for the price! Up to 9 kids can play at the same time, which is a huge plus! I love the fun wavy slide and the see-saw! I am really pleased with the price! Fun and Affordable Swing Set for Small Backyards! If you are looking for a cheap outdoor swing set for a small backyard, then this one is for you! 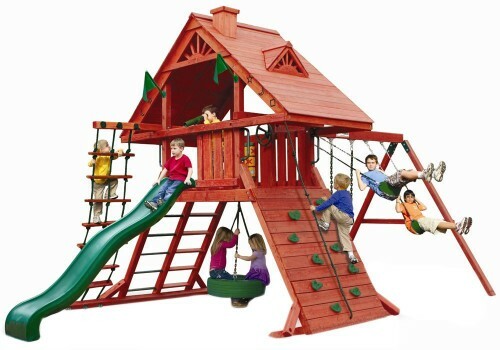 It is under 200 dollars and it fits six children playing together between the ages of 2 and about 9 or 10 years old. It will take two adults to assemble and approximately 3 hours. This is a great summer gift idea for the grandchildren! Best Kids Teeter Totters for Home!